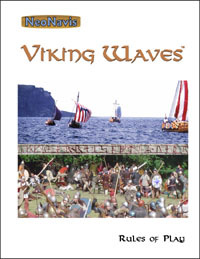 Viking Waves takes place in the areas raided and conquered by the Norwegian and Danish Vikings during the early Viking Age. It's a game primarily for two players, though limited solitaire play is also possible. The various Viking chieftains rarely fought each other directly, so players compete indirectly. The game is divided into three phases, each of which involves dozens of raids/attacks and which can be played as a separate game (or all three can be played sequentially as a campaign). In Phase 1, which lasts from 792 until around 834, each raid involves a few ships and lasts only a few days. In Phase 2, from around 834 to around 850–864, raids are larger. In Phase 3, from around 850–864 until 879, the goal is conquering land with armies and creating permanent settlements. 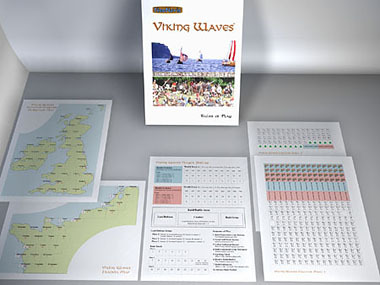 In the standard game, each player represents an ever-changing group of Norwegian and Danish chieftains. Optional rules allow for the historical division of territory between Norwegian and Danish groups, allow for limited combat between the two players, and provide for solitaire play. Robert Ott 8 8 8 Fun game, decent art work, nice historic fit. Steven Robinson 6 5 6 May seem shallow playing single phases but as a whole is a fairly decent conquest/settlement game.